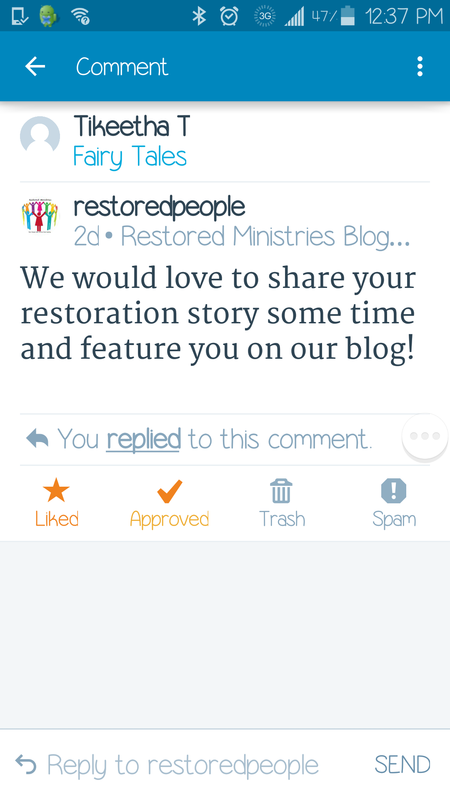 Restored Ministries is one of my favorite blogs. The blog gives it like it is by sharing personal stories of failures, successes and how God moved in you. I’ve said it before that I’m a Christian and I love reading all kinds of blogs. This blog speaks to me about where you’ve been and where you can go when you just trust. It’s like God is whispering in your ear and you have that Aha moment and your life comes into focus. I’m excited to share my story with them and I will be sure to link back here. Please check out this blog of faith, hope and strength. Trust me you will be blessed. Oh, child. If God was only still around. He deserted me years ago. I had always tried to be such a “good girl.” I begged and pleaded and promised…but He always said no. I hear your frustration but I’ve learned that every delay is not a denial. I literally had a come to Jesus moment when I cried and asked God why have you forsaken me only to be showed all the times he’s saved me. It was humbling experience. Don’t give up on God because I promise he hasn’t given up on you. Oh…there is no doubt in my mind that he saved my life many times. I firmly believe that he sent angels to protect me at times….but still….how could He allow somebody to have such a sorrowful life? I’m not whining. I’m just accepting with questions and He knows I’m mad at Him. Congratulations, nothing like getting recognized by your peers! Thank you. I’m super excited. Please do. They are an awesome blog.